WAIST HIGH: In Memory Of Tony Wilson. In Memory Of Tony Wilson. 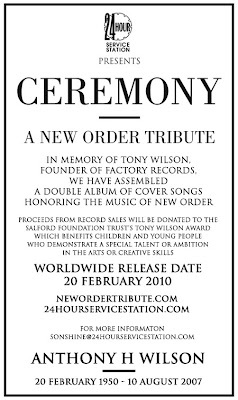 CEREMONY - A New Order Tribute, set to be released on what would have been Tony Wilson's 60th birthday, is available on pre-order. "The idea for this tribute came about in 2007, when Tony Wilson passed away from cancer. Marshall Dickson, founder of 24 Hour Service Station, was stirred to put together a fitting tribute to his hero. Upon discovery that a charity had been established in Wilson's name to aide children with creative & musical skills, the pieces came together. By late 2008, the project became an international endeavor when Ceremony was helmed by partner Sonshine Ward, who seeked out contributing artists from around the globe that were equally inspired by Wilson and moved by his passing." TRACKLISTING for CEREMONY - A New Order Tribute can be found here.